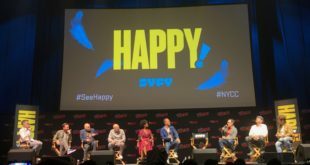 Home / TV / Syfy Announces Premiere Dates for ‘Happy!’, ‘Channel Zero’, and More! Syfy Announces Premiere Dates for ‘Happy!’, ‘Channel Zero’, and More! 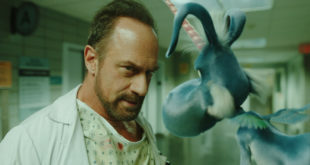 Syfy’s Fall and Winter schedule has been released, setting in stone the release of their new series Happy! starring Christopher Meloni. Created by Simon Barry, the horror series GHOST WARS is set in a remote Alaskan town that has been overrun by paranormal forces. Local outcast Roman Mercer (Avan Jogia, “Tut,” “Victorious”) must overcome the town’s prejudices and his own personal demons to harness his repressed psychic powers in order to save everyone from the mass haunting threatening to destroy them all.GHOST WARS is produced by Nomadic Pictures. Chad Oakes and Mike Frislev (“Fargo,” “Van Helsing,” “Hell On Wheels”), Simon Barry (“Continuum”), Dennis Heaton (“Motive”) and David Von Ancken (“Code Black”) serve as executive producers. The series also stars Vincent D’Onofrio (“The Judge,” “Daredevil”), Kim Coates (“Sons of Anarchy”), Kandyse McClure (BATTLESTAR GALACTICA, “Hemlock Grove”), Kristin Lehman (“Motive”) and Meatloaf (“Fight Club”). Previous ‘Game of Thrones’: Who is Beric Dondarrion and Why is He Important?